Want to be hired by Neven? I hope you are having a good day. I am booking an animal caregiver available near Metro Parc in Montreal, Quebec. My goal is to hire a trustworthy, great employee with occasional availability. 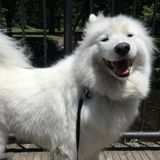 My home requires caring for Otto a 6 yold Male Samoyed, and soon a Poodle Puppy mate, providing play time, and house training. It is an asset if you have a drivers license. The perfect service provider would have cared for my own pets for years but this is not mandatory to be hired. Honest Cat Sitter needed for a 13 day holiday in August!